Protecting your home is priceless! A broken door is not only inconvenient but can also put your family and yourself at great risk! Don’t wait too long to find the time to try fixing it on your own. Professional assistance is important so you can feel protected in your home! Holes in the door, broken locks, damaged door closing mechanism - we can fix everything for you on the same-day of your call! 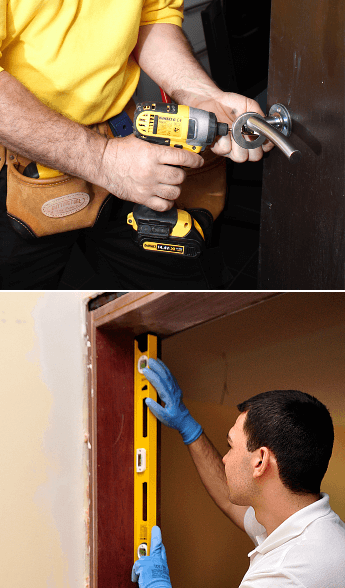 Our technicians can also install a brand new door or fit an existing one to a door frame. What types of doors can we repair? Faulty door repair can not only expose your property to risk but it can also cause the door to not be sealed correctly, which can raise your heating and cooling costs. Our technicians are experienced and trained to repair any types of doors professionally. They will describe the problem to you and will answer all your questions. Even if you're not sure what is the problem with your door, our handymen will inspect it and will find a solution. 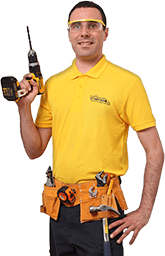 Our handymen are multi-skilled and trained to handle any type of odd jobs. They are equipped with the right tools - drill, measuring tape, pencil, level, screwdriver. For your convenience, they can even purchase an item needed for the repair on your behalf for an additional cost on the final bill. We offer 7-days-a-week availability and same-day service, so you don't have to arrange your schedule around your appointment. If you book a service online you’ll receive an instant quote for the service. You can take advantage of all of our services, while our door repair specialists are at your site. You can have your old door repaired and painted with one visit. Does your squeaky floor need replacement? Do you have flat pack furniture laying in its box for weeks? Just contact us and let us know what odd jobs need to be done and we'll take care of them.